Xi Jinping Arrives in U.S.
Xi Jinping, expected to succeed Hu Jintao as Chinese president, has arrived in the U.S. for key meetings. Xi Jinping, who is expected to succeed Hu Jintao as China’s president during the Chinese Communist Party’s leadership changes in the autumn, has arrived in the United States for a five-day visit. What do we know about Xi? He was born in Beijing in 1953, and is a native of Shaanxi Province and a leader of the fifth generation of the Chinese leadership. His father, Xi Zhongxun, was a hero of the Long March and was one of the founders of the Communist guerrilla movement in the province, but was prosecuted during the Mao era. Xi has held a number of key leadership roles, including First Secretary of Secretariat of the Chinese Communist Party, secretary of the Party Zhejiang Provincial Committee and secretary of the CCP Shanghai Municipal Committee. He also was the key man behind the 2008 Beijing Olympics. However, some questions have been raised about his educational background—he reportedly entered university in 1975 despite never studying, let alone finishing high school, and received a doctorate in 2002 despite not holding a masters. Some observers had claimed the controversy could hinder Xi’s rise, but his election as vice chairman of the Military Commission in October 2010 seems to have put such concerns to rest and strongly implied Xi’s eventual succession to Hu, who followed the same path. 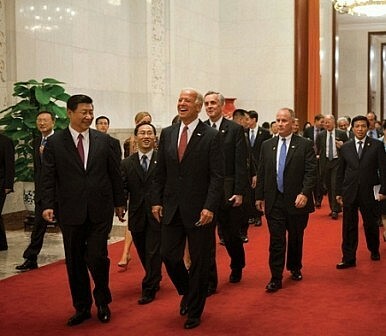 Susan Lawrence, an Asia specialist at the U.S. Congressional Research Office, has an excellent and pretty comprehensive overview of what is at stake with Xi’s visit, which begins in earnest tomorrow with a meeting with Barack Obama before he delivers a policy speech on Wednesday and then heads up to Iowa, where he is scheduled to meet Gov. Terry E. Branstad, who he met on a visit in 1985. In terms of foreign policy, Syria is bound to come up following China’s decision to join Russia in vetoing a resolution condemning the Syrian government (and as Richard Weitz notes in his commentary on the issue for us today, it seems it was very much a case of China following Russia in the decision, not the other way around). As Lawrence says, other key issues are likely to be Iran’s nuclear program, North Korea and the U.S. pivot to the Asia-Pacific. “The U.S.-China relationship is crowded with issues requiring high-level management, both urgent and longer-term in nature. All would benefit from top U.S. officials having a stronger working relationship with Xi than it has currently with Hu,” she writes. China faces tough economic, demographic and social issues it must deal with. Foreign affairs may take a back seat.